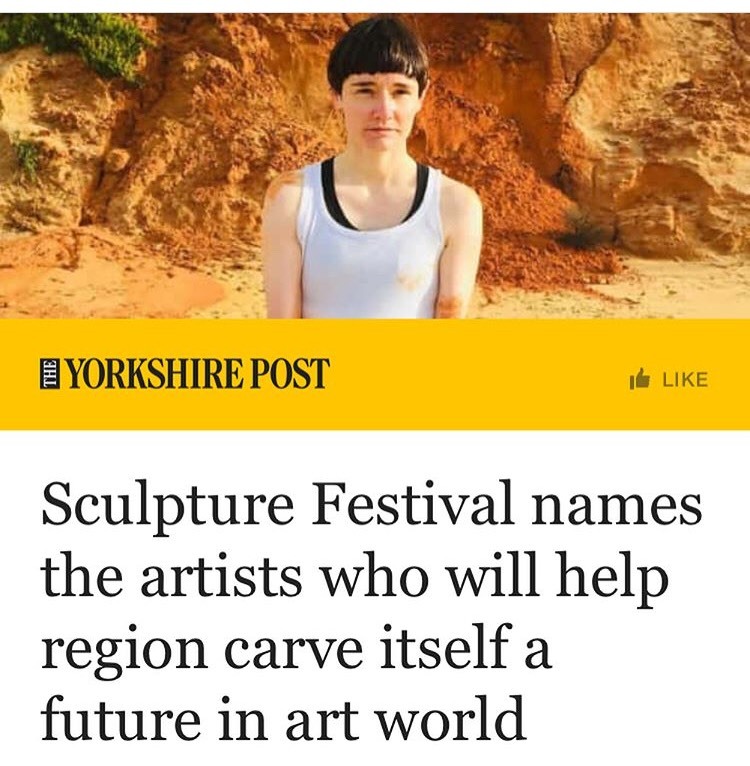 I am pleased to announce I have been selected for the Yorkshire Sculpture International Associate Artist programme. For her solo exhibition at PAPER, Rosanne Robertson presents two new series of small and intimate drawings. These works on paper, Slipping and Suspended, are distinct from each other in terms of representational and abstract form, yet both assert the boundaries of the body as structure. Suspended pins abstract and unfolding imagined forms via strings, nerves and wires- each titled by adding an object to the term suspended form. Slipping, in contrast, pins the representational body, caught in a moment, against the psychological space of the black background. Boundaries of the body and mind as it occupies, ingests, and resists its environment, is explored with appendages and imagined shapes spilling from the body. The body exposes and withstands trauma, violence and opposes conventional power structures related to gender and sexuality. Female identified sexuality and Queerness is handled outside of the realms that have oppressed it as a fetishized commodity. Apparent Femininities and masculinities are joined in a fluid structure without boundaries. The scale of these drawings pulls the viewer into an intimate space of both vulnerability and unapologetic power. This exhibition of new drawings is informed by an extensive period of performative body art in which Robertson has interrogated her own body as structure, instrument, and object in relation to assembled sculptural works. In this exhibition, drawing is presented as a political space in which to intimately explore ourselves and the human body -- in particular the female identified and Queer body. Robertson believes there is power in unfolding -- in revealing and stripping back distrusting ways we have built around ourselves. I am really pleased to be in group exhibition Tíu leiðbeiningar (fyrir hinsegin fólk) Ten Instructions (for Queer Artists) as one of ten British Queer artists selected to exhibit work based on the concept of instruction art at Gallery 78, Reykjavik. Curated by Jez Dolan (UK), Dr. Ynda Gestsson (IS) & Ásdís Óladóttir (IS). My response to the brief is to DESTROY DUCHAMP ! Which has been an ongoing concern as a Queer woman working with assembled sculpture and the body. I will elaborate more during the run of the show. 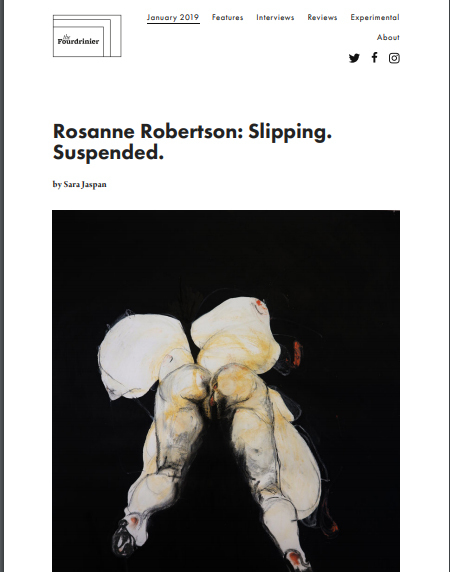 As part of her solo exhibition at AIR Gallery artist Rosanne Robertson will be in conversation with Curator Greg Thorpe. The conversation will expand on subjects and themes of the work and take the form of a circle within the exhibition space. Conversation will be prompted by a text written by Rosanne on specific objects within the exhibition, their personal histories and how they unpack issues related to wider Queer and human experience. Queer experience, gendered objects and lesbian, masc and/or butch identities intersecting with class will be explored. Conversation started by Rosanne and Greg will open out around the circle to the audience who are encouraged to participate if they would like to. This format is chosen as a non-hierarchical way of presenting an artist talk- opening conversation with others as part of an ongoing practice. AIR Gallery is accessible at ground level with step free access and a wheelchair accessible bathroom. This event is a LGBTQ+ safe space. As a feminist, lesbian and gender Queer artist in current transphobic times Rosanne would like to extend love and solidarity to all trans people and welcome them to this event without fear of transphobic ‘debate’. New works span drawing, assembled sculpture and sound installation playing with the idea of the moment and allowing it to unfold. The drawn figure is placed within the psychological space of the black ground defined as a structure withstanding violence. Drawing is presented as a political space in which to explore ourselves and the human body - in particular the female identified and Queer body. Robertson believes there is power in unfolding- in revealing and stripping back distrusting ways we have built around ourselves. Greg Thorpe is a writer, artist and curator. He works for the Salford artist community, Islington Mill, and is the Project Manager Superbia, the programme of LGBT culture from Manchester Pride. 'To The Ground'; a solo exhibition by artist Rosanne Robertson one of two winners of the AIR Gallery Platform Bursary award sponsored by Arts Council England. Conscious and unconscious explorations of the idea of Ground are presented via representational and abstract forms. Connections within the material and immaterial mind are extended via appendages and crutches which connect us psychologically and physically to the ground. Moments that are rooted and up rooted exist at the same time celebrating constant flux- joined together and exposed in opposition to the idea of an opaque and rigid dominant structure. Female form is handled by the female hands, instincts and gaze of the artist- reclaiming power taken away by an overarching patriarchal and homophobic society that fears true exploration of female power and sexuality. Femininities and masculinities are joined in a fluid structure without boundaries, suspended and fragile in a hostile space. Gendered objects including Robertson’s Dad’s discarded Sure deodorant cans sit alongside a phallic model brick structure in an assemblage titled Sure which bears the marks of stepping outside of gender norms. The white vest is prominent within assembled works as an iconic symbol of female masculinity within butch and lesbian culture. The vest is a repeated motif based on an early memory of looking to her Dad’s morning shave and copying his actions after removing a pink bow from her own white vest. Marked by red earth during a performance on the southern coast of Portugal the vest shows up the embodiment of violence imposed by invisible societal structures that instill fear of gender non-conformity. New works span drawing, assembled sculpture and sound installation playing with the idea of the moment and allowing it to unfold. Robertson believes there is power in unfolding- in revealing and stripping back distrusting ways we have built around ourselves. The moment exposes a truth which Robertson aims to reveal by allowing improvised performance with objects to lead the making process right up until the point of exhibition. Raw materials of construction and the performance of destruction reduce old hierarchical individualistic monumentalism to the communal experience of dust. Materials of labour and demolition are used referencing her father’s work and a post-industrial and working-class upbringing in Sunderland- using the red bricks that surrounded her in an ex mining Sunderland cottage during formative moments. 25 July - 3 August 2018 (Preview 25 June 5-9pm- Art Walk, Wakefield). Collaborator Space, The Art House. ReModel is an exhibition by artist Rosanne Robertson following a research and development project exploring the idea of power at the margins. A central focus is a personal project exploring gender non-conformity, mental health and societal structures- producing a new body of assembled sculpture and drawings works. Focussing on the relationship between mind, body and environment these works celebrate the moment as the site for change and remodelling. Rosanne imagines the physicality of the site for change and how it involves the body- destruction of the past, embodying resistance to dominant structures and renewal. A homophobic, rigid and patriarchal society can lead to a deep distrust and hatred of our own selves, bodies and variations. During research and collaborations Rosanne considers the psychological and physical effect of being at odds with a system. Starting points involve automatic drawings that embody the mutilation of Queer female identity considered deviant in over riding patriarchal capitalistic system that rely on rigid and binary understandings of gender and sexuality. 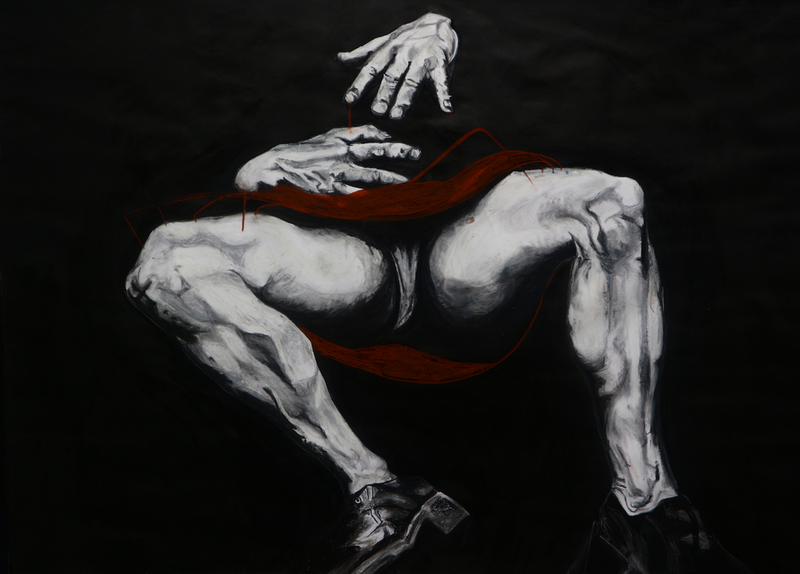 In contrast representational drawings on the psychological space of the black background depict the body as structure- withstanding its brutal environment and workload with re-built re-connections and crutches. Assembled sculpture is used to build new meaning and make new connections piece by piece as opposed to a single totalitarian sculptural object. Fragile connections and abused objects are held in a moment together- in an ongoing process of renewal. This project is supported using public funding by Arts Council England. Rosanne Robertson is supported by The Art House during this project as a bursary studio holder. Barry Finan and Rosanne Robertson exhibit their collaborative installation YES LAD YES LASS in a group exhibition curated by gallery director Zavier Ellis and artist Hugh Mendes.